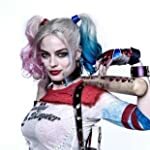 Poll: Face-Off: "Gadot as Wonder Woman" vs. "Robbie as Harley Quinn"
Gal Gadot and Margot Robbie have played two popular comic book female characters in DC Comics' new adaptations. Godot has played Wonder Woman and Robbie has played Harley Quinn. Whose performance have you enjoyed more? Gal Gadot as Wonder Woman.